Reduced Sodium Worcestershire SauceLEA & PERRINS presents Original Reduced Sodium Worcestershire Sauce, making it easy and mess-free for you to infuse savory flavors and aroma in your food. We have combined the best of flavorsome, aromatic ingredients so that you don't have to. 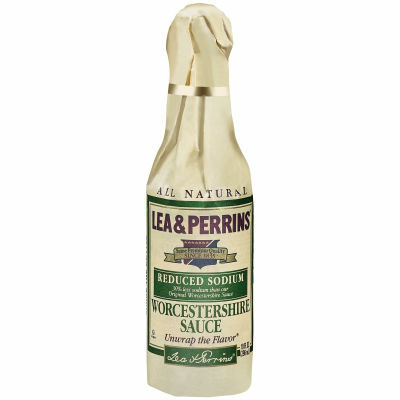 LEA & PERRINS uses only the finest ingredients sourced from around the world to produce a flavor unmatched.A Perfect Balance of Savory FlavorsLEA & PERRINS Reduced Sodium Worcestershire Sauce helps you prepare food, aromatic with garlic, tangy with distilled white vinegar & tamarind extract, spicy with chili pepper extract and sweet with sugar & molasses. So flavorsome, it's bound to make your taste buds crave for more! Just toss your chicken, meat, fish and vegetables in Reduced Sodium Worcestershire Sauce or drizzle it while cooking too, it will add scrumptious flavor to your food.